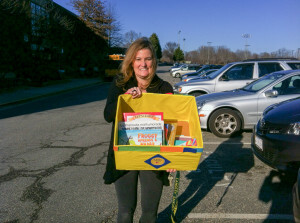 The Langley High School Spanish Club in McLean, VA collected books for Balint Charities. Their sponsor, Jen Stocks, presented the books to BCI President Kathleen Christesen. The Langley High School Spanish Club in McLean, VA collected books for Balint Charities. Their sponsor, Jen Stocks, presented the books.